The smart home future is here... sort of. But really how smart are a bunch of different devices all speaking different languages? Unfortunately, the smart home can be very stupid and often takes longer to set up than breathless advertisements imply. We’re here to tell you how you can build a smart home where everything works in harmony. As we’ve recently noted, not much in the smart home world is truly universal yet, but hardware and software makers are slowly catching on. Devices like the Chromecast, Sonos speakers, and Eero routers simplify setups that were once painfully complicated—only people of a certain age will ever appreciate how magical it is to tap a button and have video instantly beamed from smartphone to television. A good starting point is to work out whether you want to dabble in the smart home scene or go all-in with your automation, and we’ve covered both choices below. Going device by device is easier and cheaper, but can get messy and prove hard to upgrade; committing to one platform and hub is more limiting for now but may pay off later down the line. While we’ll do our best to guide you towards a kit that’s compatible, and explain the competing standards out there right now, the truth is we’re not yet at the stage where everything in the Internet of Things speaks happily to everything else—that’s still a way off. You can either automate a lot around the home, and control everything separately, or go through one central hub, and take what you get. We’ve mentioned that individual aspects of the smart home is slowly improving, and if you’re buying a one-off device, chances are you’re going to be very impressed: buy an Amazon Echo, or a Nest thermostat, or a Philips Hue lightbulb, and you can add a little intelligence to your humble home in minutes. You can even rig something up yourself. Thanks to the ubiquitous Wi-Fi most of us now enjoy, getting devices online and connected is easier than ever, which means mobile control from the palm of our hands is pretty straightforward. You can get smart locks, smart lights, smart fridges, and more besides, and generally speaking, the user experience is getting up to somewhere near a respectable standard after several years of hits and misses. The benefits of making one-off additions to your smart home are that everything should just work the first time, and you can keep costs down too. Focus on the parts of your house you want to make a little cleverer (like your air conditioner) and leave the rest in blissful ignorance for the time being. The big downsides? Everything in your home has a separate app and nothing works together. You can’t dim the lights and slide down the blinds, or open your garage and unlock the door, or do anything else at the same time and in the same app without embracing one of the (fledgling) platforms out there. There are workarounds, but they are just that: workarounds. Our favorite is the Field Guide regular IFTTT (If This Then That). It can tie together different smart home gadgets with impressive skill. It can do tricks like getting your Echo to talk to your Nest or keeping your lights and heating in sync, but it’s not ideal for building an overarching system. Yet it’s still another layer of complexity and another app to deal with. Throwing everything behind one particular platform will save you from learning the ins and outs of IFTTT or keeping a dozen smart home apps on your phone. Yet none of these platforms are anywhere near perfect yet, which is why many people are sticking with the wait-and-see approach. The easiest way in to embracing a hub is to buy yourself an Amazon Echo or a Google Home and then pick up the rest of your kit based on what else is compatible. The Amazon Echo devices work with gear from the likes of Philips, Belkin, Honeywell, TP-Link and more—in fact, its growing support for third-party apps and products is probably where it’s still strongest against Google’s rival smart speaker. Google Home hasn’t been around as long as the Echo, and it shows in terms of what else works with it (and the companion Google Home app). The list of working smart home products is less impressive than Amazon’s. Though there are still some major mainstays. Manufacturers like Philips and Belkin have recently joined the Google party, and Nest and Dropcam devices work, but they’re both now subsidiaries of Google. Apple HomeKit, meanwhile, has been with us since 2014 but is still waiting for its breakthrough moment. There’s no always listening speaker to use, so you’re stuck with your iPad, iPhone or Apple TV for controlling everything. 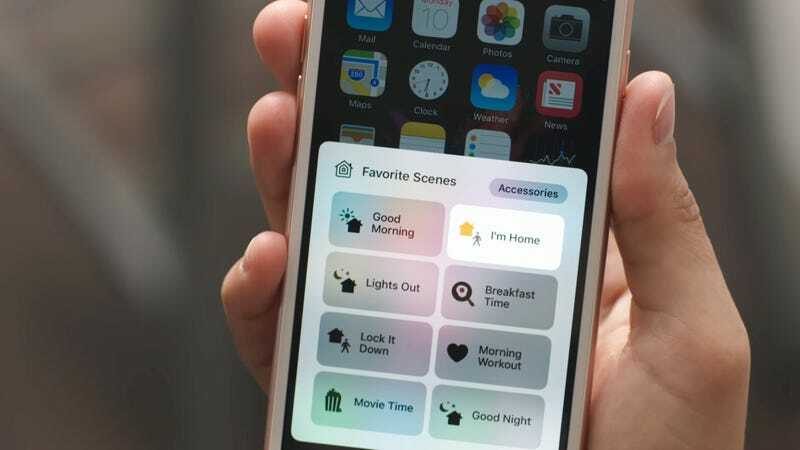 Yet the number of gadgets with the works-with-HomeKit badge continues to grow and grow, and few smart home platforms offer the simplicity and ease-of-use of Apple’s app. If you don’t want Apple, Google, or Amazon running your smart home, then SmartThings (now owned by Samsung) is another option. It’s the most comprehensive out there at the moment, with a plethora of supported devices, from SmartThings brand sensors and switches to third-party kits from the usual smart home suspects like Philips, Belkin, Netgear, and Ecobee. It even offers integration with both the Amazon Echo or Google Home. Yet set up can be almost as bothersome as the IFTTT solution. So SmartThings isn’t recommended if you don’t have a full afternoon set aside for getting things going. Wink is a direct rival to SmartThings and has a list of compatible devices and services that are just as impressive. As with SmartThings, you can hook Wink gear up with Google Assistant or Amazon Alexa, and everything is handled with one central hub. We haven’t had the best of experiences with Wink in the past, but we’re prepared to give it the benefit of the doubt and imagine it’s got better over the last couple of years. Plus, as we’ve already said, no smart home platform is perfect right now. Other platforms are available, but we’d suggest sticking to those five options for now, even if it’s hard to predict which way the smart home market will turn next. In a lot of ways it’s down to who you trust to make the best software, sign the best deals and attract the most developers in the next few years—and then you’ll really have a smart home to be proud of.